This exciting fantasy horror film include plenty of laughs along the way, many of which are provided by famous actor and all-round comedy genius Jack Black. Playing Mr. Shivers, Jack Black has a fairly understated role for the first part of the film, appearing as nothing more than a grumpy neighbour to Zach Cooper and his mother Gale, who have just moved to the town of Madison from the home in New York. 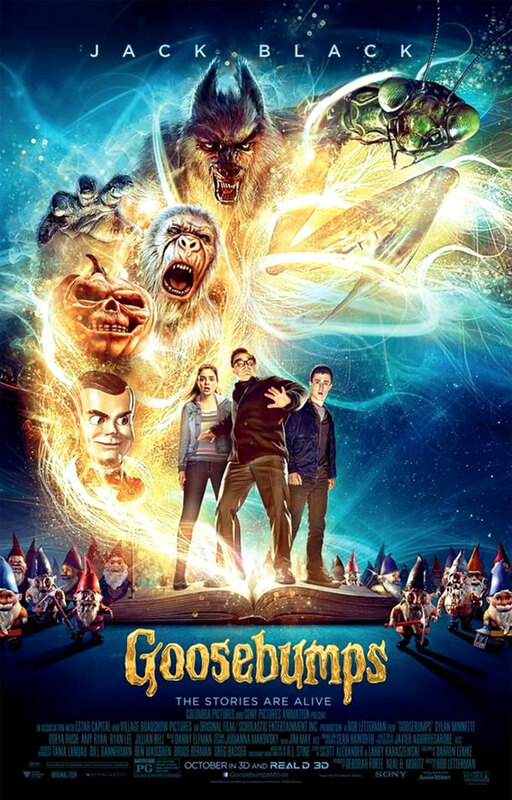 As the story progresses, Zach befriends the daughter of Mr. Shivers and soon learns that her grumpy father is actually the author of the much-loved 'Goosebumps' children's stories. However, when Zach opens one of the books about a Yeti, the monster comes to life and jumps out of the pages, and it's not long until all of the books are being knocked off the bookshelves and opening up, causing chaos and panic stations. In no time at all, the town is filled with everything from graveyard zombies and a werewolf, to the invisible man, a creepy ventriloquist's dummy and some very cute looking garden gnomes, which aren't actually quite as cute as they first appear. While it is fair to say that Jack Black really does steal every scene that he's in, his character of Mr. Shivers is very much complemented by the action and excitement going on around him, and of course, there are more than a few comedy moments along the way. With a PG certificate, this film is more of an enjoyable adventure than a scary movie that would cause children to hide behind the sofa. There is a hint of a possible sequel at the very end, so here's hoping. This is definitely one of the best films that Jack Black has starred in for a very, very long time. I thought that Gulliver's Travels was hugely disappointing, although he is great as the voice of Po in the Kung Fu Panda movies, obviously! I did also love him in Be Kind Rewind and The Holiday with Cameron Diaz, Kate Winslet and Jude Law. Nili Rating: 3 1/2 out of 5 - Not quite a 4 out of 5, so I've given it a strong 3 1/2. This film is perfect for children who enjoy an adventure that's not too scary. I'm sure that it will become a Halloween classic in future years.